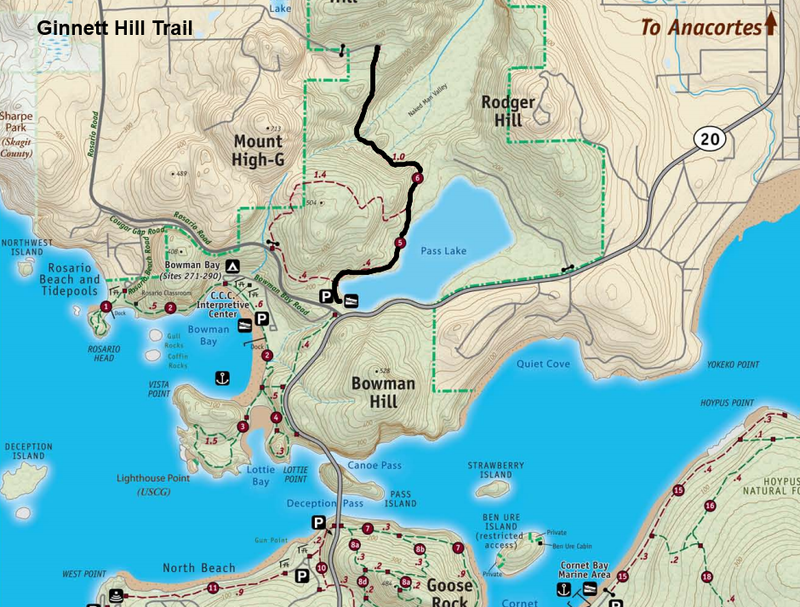 Last week, I returned to Ginnett Hill in the Pass Lake area of Deception Pass State Park. Recall when I visited back in January I discovered a Kingdom of Moss. That was the middle of winter. Now I was curious to see what I would find there in the middle of summer. Back in January I noticed a plant I didn't recognize. It was attractive, rich green and healthy looking with shiny leaves. It was an evergreen that really stood out among all the wintering forest vegetation around it. I looked through my books but couldn't find it. This trip I was curious to see if I would catch it blooming. Maybe that would help ID it. Again, there were no flowers on this visit and I was still not able to identify it. I didn't have enough to narrow down an internet search either. I tweeted a photo to Washington State Parks (@WAStatePks) to see if they knew what it was. The response I got from State Parks was both quick and helpful. It was also emphatic, on the order of "YIKES! DON'T TOUCH IT! Tell us where it is." They told me it was Spurge Laurel (Daphne laureola) and that it was a Class B noxious weed in Washington. Apparently it can be quite invasive in natural forests. It is especially a problem in dry Madrona/Douglas Fir forests which is exactly what this site is. It is located near the summit of the Ginnett Hill Trail where the canopy opens to allow sunlight to reach the understory. It spreads both by seedlings and root suckering. Stands can become large and dense choking out native vegetation. Once it gets established, it is very difficult to eradicate. 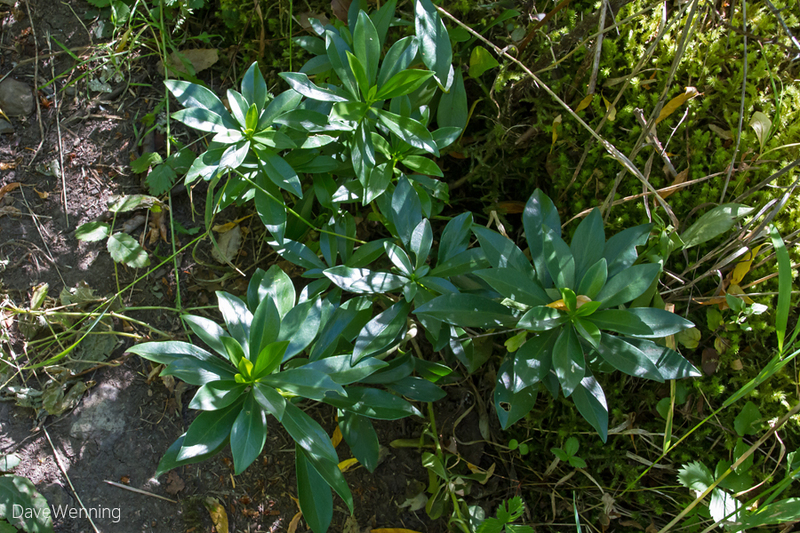 The plant is neither a Spurge (Euphorbias) nor a Laurel, but a member of Thymelaeaceae, the Mezereum family. You can say Thimmel-ee Acey-eye. It is native to Europe, western Asia and north Africa. The berries, stems, bark and leaves are toxic to humans and pets. Apparently, birds and rodents can eat the berries and this is how seeds are spread. The sap can cause contact dermatitis and blistering on the skin. Eating plant parts can produce swelling of the tongue, nausea, vomiting, internal bleeding, organ failure and possibly coma. Gloves should always be worn when handling plant parts. This morning, I returned to the site with Andrew Fielding, Resource Manager for Washington State Parks. 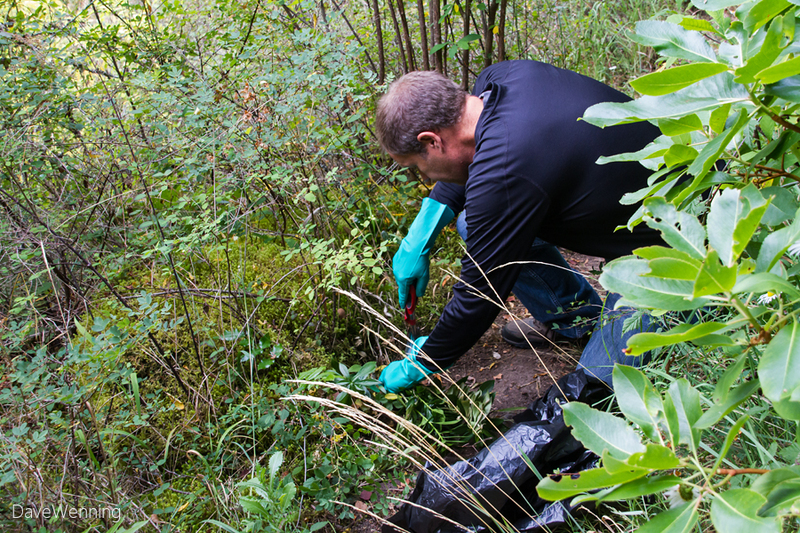 His mission was to remove the plants if possible and to survey the extent of the infestation. As we looked around, we found several patches. It will be necessary for him to come back and bring additional tools to get this stand completely eliminated. 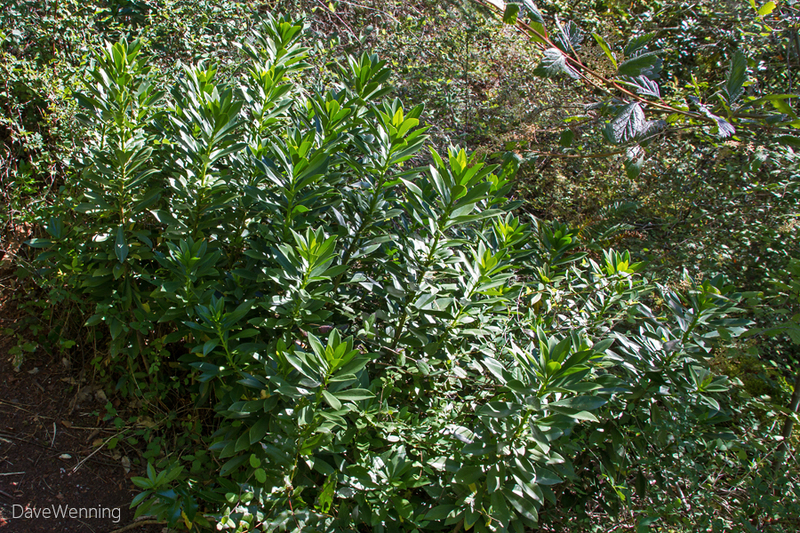 Spurge Laurel should always be removed from private property before it becomes established. The King County website has instructions for accomplishing this. If you find it growing on public lands, the location should be reported to the government agency responsible. This would included county weed control boards, state, city and federal parks, and so forth. Last week I took several photos of the wildflowers I found growing along the Ginnett and Pass Lake Loop trails. I will be posting those shortly. I assumed this Spurge Laurel would be just another one among them. I could not imagined the turn this story would take. You never know what interesting things you will discover when hiking in the woods.